Firstly then, the action as it should be. The keys should be light, very free, with little or no side-play. Weighting the keys with lead is avoided as far as possible. The back touch (i.e. where the rear end of the keys rest) should be made up of thin layers of woolen cloth sewn together, not a lump of felt glued in place. The top rear surface should be covered with doeskin rough side up (or a close-woven cloth) nailed, stapled or glued in position at the extreme ends only, for the bottoms of the jacks to rest upon. On no account should the cloth be glued under where the jacks rest, this can give rise to action noise. Then there is no lost motion due to masses of thick soft felt being compressed. Coupler dogs should touch similar leather under the upper manual key-end. Many keys from old instruments were very light to start with, and were often tapered and cut away underneath to balance them. If two jacks are removed from a key end, the key should be at balance. This gives a nice playing weight, the action is thus positive when only one row of jacks is fitted. It is easier to level the key-fronts when the keys ‘lay back’ without jacks being present; if they don’t, identical weights should be laid on the rear of the key while leveling; coins work fine. The jacks themselves should be a close fit in the guide (‘register’), and yet be absolutely free to move up and down even if they lean ten degrees to the right or left of the vertical. The key dip should be 7mm. on the lower manual, but only 6mm the upper (measured at the front of the naturals). A coupler mechanism should have 1.5mm free play in the engaged position, measured at the key cover – it’s very much less at the coupler dog. This means that the jacks on the upper manual move the same distance vertically if either upper or lower keys are fully depressed. Short keys on a single-manual instrument are best given a key-dip of 6mm. A rather larger key dip is set initially, while the keys are leveled and the back- touch is set. The final key-dip must be set by adjusting the position of the jack cover rail, or the number of layers of cloth under it, so that the jacks are stopped by contact with the padded rail. This is very important – it’s the last thing one does, and it can transform the action of any instrument. The jack cover rail should be able to be securely fastened in a manner which allows for easy removal. Assuming that the instrument is strung and tuned roughly to the pitch for which it is designed, the next stage in setting the action prior to voicing is to fit all the jacks into their respective positions. This is best done before fitting the plectra (or the tongues where these can be easily fitted later). When quilling a new instrument with wooden jacks and real feathers, the operation of quilling is done before the jacks are fitted to the guides: the quills are cut off against a block to leave about 12mm protruding, and the order of the jacks in the row is then determined by feeling the strength of the quills with the fingers: the strongest quills are in the bass. When re-quilling an older instrument, the jacks are already numbered and so the quilling requires greater care and experience. The jack guides must now be set in the ‘off’ position. If a row of jacks plucks to the left, it is ‘backed off’ by moving the guide to the right until the jacks miss touching the nearest string to their right by as little as 0.5mm, such that if you pluck this nearest string it can vibrate but does not touch the jack. Set both 8ft. rows in this fashion, one backed off to the left, (close to the 4ft. strings if the instrument has any), the other row backed off to the right. Then look hard at all the string positions relative to the jacks: make sure that there are no glaringly wrong string positions. If there are, alter them by moving the pins at the nut. Don’t allow the close pair of strings to sit too closely together in the bass, as this will allow the strings to jangle against each other….you may like this interesting noise, but it’s not required. When the geometry looks right, check the guide positions again, since some more space may now be available each side of the jacks. 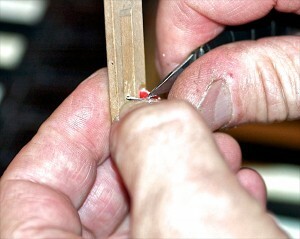 Jam the guide into this position so that it won’t move during the next few operations, using a small wedge of wood. If plastic jacks are used, now is the time to complete their assembly and to check each jack to see that the spring pressure is only just enough to hold the tongue forward against its stop, and that the tongue itself is absolutely free to move (sometimes a wooden tongue must be shaved a little). If jacks fitted with a top adjusting screw are used, beware. The screw is there for setting the tongue position and thus the spring tension, not for adjusting the plectrum setting and the sound it makes. It is set now, and not touched again. The original reason for using such a device was to help when voicing plectra of modern hard leather, when in fact it is a godsend: but it is not used in this fashion with delrin or quill, as a reliable action needs each of the plectra to sit under the string by the same amount. 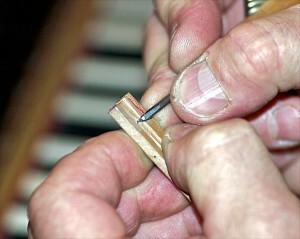 All adjustment of the sound is done by cutting and scraping the underside of the plectra. Spring tension is set by gently bending the spring if it is made of hog’s-hair or wire, or by actually changing it. Plastic moulded springs are supposed to be adjusted in this way, but it is not very effective. It is often best to reshape the spring gently with a sharp scalpel to make it less massive. This makes a more reliable light spring than just bending it. Light spring tensions are required, so the physical size of the spring is important. There is however a limit to the injection moulding technique used, hence the size of some springs. Don’t forget that the more care and patient work is put into eliminating possible faults before voicing, the easier that operation becomes. Incidentally, the best tool for shaping plastic springs and for voicing both delrin and quill plectra is a Swann-Morton No. 3 scalpel using No. 11 blades. You need other tools; a nice quality pair of 5 inch pliers to push plectra into the tongues and a very good pair of needlework scissors for dampers, at the very least. The next stage is to ‘set for silence’. In order that the action of a harpsichord should feel light to play, the plectra must be fairly long. Short plectra will be more difficult to voice and will not last as long, as there is less material to do the same amount of work. Coupled with this the plectra must sit under the string by a reasonable amount, a little more than the thickness of the strings in the low tenor region. The looser the jack fits the guide, the more of the plectrum must show on the other side of the string it is plucking, in order that the note can repeat properly. Since it is clear that the amount the plectrum moves the string from rest will affect both volume and tone, it should be clear that this ‘tip under’ distance must be fairly even throughout. So, with the guides in the ‘off’ position, firmly wedged, cut all the plectra to JUST MISS the strings they should be plucking. Use a very sharp scalpel blade, and preferably cut on a block, as left-hand thumbnails only last for one instrument in any given month. This operation is best judged by eye, then checked by car. You should end up with an absolutely silent instrument; this is well worth the trouble as later it makes the actual voicing much easier. 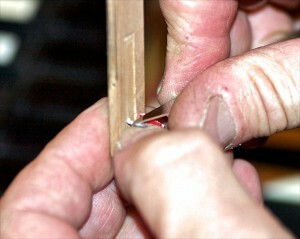 The cuts at the end of the plectra are made at 45° to help the plectra return past the string easily. The next step is to un-jam one guide. Adjust its position (without altering the ‘off’ position capstan screw) so that the plectra protrude the correct amount past the strings. This is done most easily by looking at the extreme bass where the strings are thickest, from vertically above. It should be just possible to see the tip of the plectra. Then adjust all of the jack heights by means of the screw or threaded weight often provided at the bottom of the jack, so that the plectra are all roughly the same distance below the strings. An old instruction suggested that in the bass the plectrum should protrude by the thickness of the string, 0.5 – 0.6 mm, which leaves rather more of the treble plectra showing; it seems to work well if the jacks are a good fit in the registers. Accurate adjustment should be left until all the voicing is done, and just before the dampers are fitted and cut. It should perhaps be pointed out that the more the plectrum protrudes under the string, the greater the vertical distance between string and plectrum must be, to allow the plectrum room enough to pass the string on its return journey. Also, plectra of a 4ft. row will ideally protrude less far past the string, and thus be capable of a closer vertical setting than any 8ft. row. However if an instrument is fitted with a lute stop in its own gap running close to the nut the settings are of necessity as close as for any 4ft. row, since the jacks move only a short vertical distance due to the reduced leverage available from the keys. When all this is done, the row of jacks should play from the keyboard fairly evenly. The sound will be rather loud, and the touch heavy, but this is an excellent starting point for voicing. Tune the instrument as best you can now, as this will help too. Make sure that the C’s are in tune with one another. Remember that it is no good voicing at one pitch, then altering it to play, since the quality of the notes will alter when the pitch does, but maybe not so evenly. VOICING AND REGULATING Recently, ‘Prevoiced’ plectra in delrin have become available from Adam Swainson, who makes fine jacks. These plectra are made in four strengths, and theoretically need only to be cut to length. They do need to be voiced after, but they are much easier for the amateur to use, they are fast and there’s much less chance of making mistakes. Most of the voicing can be done using scraping rather than cutting. They should be in every harpsichordists’ toolkit. Voicing can now be started. Use a new blade for each row at the very least; the blades don’t stay sharp very long. The length of the plectrum is not altered during voicing, tone and volume being controlled by shaping the underside only. When correct the plectrum should bend evenly during the plucking action, in a parabolic curve. Its shape should be evenly tapered in both width and thickness. The width at the tip should change progressively from widest (maybe only a little narrower than at the root where it leaves the tongue) in the bass to maybe half the root width in the extreme treble. Some makers leave their plectra much narrower than this; the overall sound of the instrument will be quite different in this case, with far stronger high harmonics. If you pluck a wire with a wide plectrum certain harmonics will be inhibited; as an extreme, a piano is struck with a very wide soft felt to purposely inhibit all but a few harmonics. The thickness of the plectrum also varies progressively: the plectra should not be cut too thin as this will shorten their life. A happy medium between width and thickness is desirable. The 4ft. plectra will be smaller than the 8ft. ones, but in proportion to them. All the plectra will end at the tip with the 45° cut which was made when ‘setting the silence’. The top surface is left untouched. The bottom surface of the plectrum is rounded by scraping. This should be the operation whereby the sound quality and volume are made even throughout the entire row. Quill is easier to voice than delrin since it has a grain to help you: cutting straight through a delrin plectrum is remarkably easy until you gain confidence in the knife that you are using. Now sound all the C’s and tune them if necessary. Cutting very carefully and looking at the plectrum shapes, balance the sounds so that all the C’s sound nice individually, and together no one note is more evident than the others. I have found that the best way of checking this is to sound four C’s together, then leave one out, then another and so on. It is much easier, for some reason, to hear that a note is missing than to hear which one is louder. Any note not loud enough is going to leave a big gap in the harmonic structure of the whole unison sound. Be very careful in the bass, as it is easy to voice the bass too loud, so that when the instrument is completed the tenor is overpowered. Now listen to the sound. If it is clear and pure and you like it, well and good: if it sounds forced and the pitch is higher at the beginning of a note than when the note has started to die away, then the plectra are plucking too hard and should probably be scraped a little thinner. When you are satisfied, starting from middle C, voice the naturals for one octave upwards, checking all the time that no one note sounds above the others (an interval of one tone between two notes played together can sound nice when you are used to it). Then do the next octave of naturals using the C’s as a guide, and continue until you run out of notes. Now work down to middle C, voicing the accidentals. Next, repeat in reverse down to the bass and back to middle C. Now the row of strings should be tuned fairly accurately, so that you can hear what chords sound like. The row should sound beautiful. If any odd notes sound dead, lacking in upper harmonics, check that the pins in both bridges are both tight and clean of fluff or oil. A note that warbles and produces beats all on its own may be due to a twisted or kinked string: such a string must be changed. Making the plectra less wide will sometimes bring out more upper partials; this is how to make the bass more reedy in quality. What must be borne in mind is that all the possible variations in tone and volume are made within a fairly small range: the basic sound quality is built into the soundboard design at birth, as is the possible volume. All that voicing can do is bring out the best from what is already there. A bad instrument can often sound better voiced more quietly, when the soundboard has less work to do. A well-voiced row feels right: all the notes seem to require the same pressure on the keys to make them play. It is often easier to feel loud notes than to hear them at this stage. With one row voiced, the rest becomes easier. Set the back 8ft. row in the ‘on’ position and set the C’s as before, but also matching them to the front row. Then repeat the whole procedure. When you do the 4ft. row, you will find it needs to be a little quieter than you would think. This is because it will ‘speak’ or ‘fire’ before the other notes on that key and will thus be more apparent. Now that the instrument is voiced, the firing order of the jacks must be adjusted. The distance of the plectra under the strings of the 4ft. row is set as close as possible (remembering that the notes must be able to repeat quickly and faultlessly). The back 8ft. jacks are set to fire soon after, but far enough behind for you to be able to hear the two notes individually if the key is moved very slowly. The row of jacks on the top keyboard of a double-manual instrument are set to fire almost as quickly as the 4ft. row, the idea being that when the keyboards are coupled, the play between upper and lower keys causes the front row when played from the lower manual to fire later than the back 8ft. row. Any other rows of jacks should be adjusted to fit into this pattern. I is very important that the jacks do not pluck simultaneously, and that the order of firing is the same throughout the compass. If all the jacks were to fire at the same instant on a 3-row instrument you’d need a sledge hammer to play it. The same instrument with a properly staggered firing order would be light and even to play, since the after-movement from one pluck helps with the ones that follow. A key-dip of 8mm. is enough to accommodate five staggered plucking heights without difficulty, so this operation is not unduly complicated. The last stage is fitting the dampers. There are many types, mostly using a thin hard felt, known as ‘bushing cloth’ or a rather thicker, woven cloth called boxcloth: both are available in many finely-graded thicknesses from piano supply houses. Jacks from old instruments have one or two sawn slots alongside the tongue to |in. below the plectrum height for the damper felt to fit into. 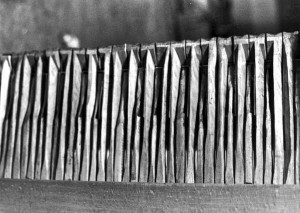 Nowadays there are two; methods of cutting damper felts – either as described below (at 45°) like most old instruments, or by the damper slot being cut to just above the quill slot; the damper flag being left at right angles to the jack body, and hanging on the string at all times. This method has the advantage of allowing the soundboard to expand and contract a lot, moving the strings up and down, without any change to the damping; but the strings have to be spaced out more, since the damper must stay on the string when the row is off and on. The beautiful sympathetic vibrations from an un-damped, un-played row of strings which is produced by the older method of damping is lost, however. I prefer the traditional way, but many modern ‘traditional’ harpsichords by fine makers use square hanging dampers; anyway, you will probably use whatever method the instrument was set up for when it was made. The correct felt should be cut into strips about 8mm wide. It should be of a thickness that fits the jack slot tightly without spreading the top of the slot. This ensures that the felt is gripped along the whole of the slot and is therefore less likely to work loose. You slide the strip down into the slot and pull it back until it protrudes a little longer than the plectrum. The felt is trimmed close at the back of the jack with the scalpel, and cut level with the end of the plectrum (using very sharp, straight nail scissors, the sort that cut right up to the tip) so that it looks rather like a flag. The 4ft. row is tackled first since it is the hardest. It is useful to use a board laid across the instrument, or if the lid id on and closed, use that. Do them a few at a time since then you don’t have dozens of jacks everywhere. Fit the ‘flag’ on each of the batch, starting at middle C for convenience, and lay them out in order. I usually do middle C and cut it to damp first to get the feel of it; then one at a time, cut the lower free corner off at 45°. The exact amount that is cut off is determined by trial and error at first. 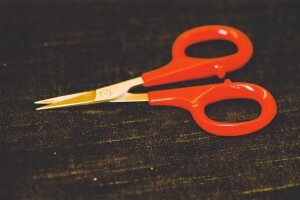 It becomes easier very quickly so that eventually only one cut is necessary. The correct cut is achieved when, the jack being replaced, the string can be moved away from the jack horizontally without the jack dropping vertically appreciably. The note must of course damp (when played) immediately the jack returns. If the jacks hang onto the strings by their dampers, and the row is moved to the ‘off’ position, when you try to move it back ‘on’, the dampers will press against the strings, thus not allowing the jacks to resume their correct playing positions. One piece of felt is easy to bend, but fifty or sixty are definitely not. The 4ft. dampers must be trimmed so that they do not touch the nearest 8ft. string on the way past it, and the top corner of the 4ft. damper is best cut off too, since this leaves less to foul the 8ft. string by accident. This operation is fairly important and critical. The rest of the dampers are simpler, so should give rise to no new problems. The last part of the action to receive attention is the jack cover, which is not there just to stop the jacks flying all over the room. When the cover is fitted, the jacks should actually touch the fabric a fraction before the key-front ‘bottoms’. This helps the jacks to return quicker, and keeps the action quiet. It will take a little time and a lot of playing to make it perfect. The string band may settle down in the first month if it’s a new instrument, and you may have to re-adjust the heights of the jacks. If this happens, wait for the settling process to complete itself, then regulate the whole instrument again as methodically as the first time, and recheck the damping. Quill should last four years or more, depending on how much the instrument is used; but the odd quill will split vertically, or de-laminate horizontally: the owner really should learn to fit new quills and be prepared to do it at short notice. I have known quill to be still good after 5 years and working for far longer, but it’s more usual that the instrument needs to be checked at six-monthly intervals if it’s played a lot. Delrin seems to work-harden (there is some disagreement about this: maybe UV light hardens it). Usually the instrument needs voicing down a little every year in parts of the compass as it gets louder with age and gives a harder sound. A well-played instrument will need new plectra after about 4 years; the signal for a new set is when one or two plectra break off at the root, near the tongue. The rest won’t be far behind. I’ve known delrin still working after ten years. The sound will become hard enough to merit new plectra long before the material actually breaks. Maintenance. There are some other matters which need to be explained; New harpsichords undergo changes as they get used to the tensions placed upon the structure by the strings; wood moves; and sometimes things stop working as they should. The commonest problems are hanging jacks, sticking keys and binding registers. The first two years are when most of the changes happen, but a radical change in the environment will have an effect on an older instrument. If you and your harpsichord live in a damp cold Scottish castle and you move to Texas, both you and your harpsichord will have problems (and the other way round, naturally). So here are some tips. If you can not move the jack-slides using the levers, or if doing so seems too difficult, the registers could be binding. It is possible that a large change in the weather is the cause. If the registers are covered with leather, the edges of the leather probably protrude a little beyond the edge of the register sides. The most usual reason for registers binding is if there’s very little free play and humidity increases, causing the wood or more likely the leather to swell. So the first thing to do is DON’T PANIC and wait; check the relative humidity level. Are you running a humidifier? if so you probably should not; humidifiers are really to combat the drying effect of winter heating. Some people find that they have to run dehumidifiers in summer. My workshop has both, I aim to keep things steady at 50-55%. Problems often go away when the weather changes. A small hygrometer is very useful; cheap hair types are slow but they react in much the same way as wood, so don’t go and buy a museum quality device. I like the ones that have a maximum and minimum temperature read-out as well as relative humidity, you can have endless fun with them in the kitchen. However, binding registers are an example of the things that can and do happen in the first 2 years of an infant harpsichords’ life. It can be corrected by removing all jacks, and the levers; then opening the spine window and easing out the registers which can then be planed a little thinner before being replaced. It is not difficult but is best done by a harpsichord technician or maker; registers tend to be delicate. It is possible that the gap has closed a little in which case this bit of surgery is the only solution. You could check this by seeing if there is more free play at the ends of the registers than in the middle, you may need to remove the levers to check this as they will otherwise prevent movement across the gap. If however the registers can’t be moved then the instrument will have to be de-tuned to take the tension off the structure, best done by an expert. The most common cause of a sticking note is restriction at the upper register which could be caused by muck of some sort (this is usually cured if the jack is removed and then replaced) or by swelling of jack body or the leather covering of a register. It is also possible that the pin through the tongue somehow protrudes from the side of the jack and fouls the register; this is easily corrected, simply push the pin back in. If this happens repeatedly, squeeze the end that sticks out with pliers to squash it a little, then push it back. Play the note, let the key return, watch the jack; lift the jack by hand and let it return; if the restriction is at the register it is then apparent. Lift the jack out and rub its’ surfaces on a hard smooth piece of wood to burnish it – a real wooden pencil will do if its not painted or varnished; I use the handle of a scalpel, which is very straight and smooth. Return the jack; if it is still sticky you can move it up and down rubbing it sideways to press on the leather, not too hard. Usually this works. The spinet I restored in Sulgrave Manor is kept at 90% humidity or so the curator says, no heating and doors open all year for countless visiting parties, and each time it is prepared for a recital it, the jacks all have to be burnished or they stick. If it seems to be the key itself, that’s a different problem. Is it an upper or lower key? What happens is that stresses in the wood release themselves over the first year or two of an instruments’ life, and as atmospheric conditions change. Lots of makers use the softer and lighter American basswood for keys to almost completely avoid the problem; lime although tough is not quite so reliable, and we suffer the consequences – or you do! Sometimes the release of stress in a key results in the key bending up or down, as is intended; this is easily corrected after a year or two by leveling the keys with paper washers under the balance rail. But sometimes keys twist or bend sideways, causing binding at the far end where its position is controlled (either by a pin or blade set into the end of the key running in a slot in the rack, or by a steel pin driven into the key frame running in a slot in the key end). Take all the jacks out and to remove both keyboards together. Locate the offending key and see exactly what is binding. It is sometimes possible to press the rear guide pin slightly to one side to release the friction; this can move the front of the key in such a way that it rubs on the next one, so it may not be a solution; in any case the pin should be bent gently from the bottom, and not with pliers which could mark the pin and make matters worse, but with a rod of metal with a hole a little larger than the pin diameter. Releasing the pin momentarily this way really tells you the extent, direction and ‘cure-ability’ of the problem – it makes you feel better! If you remove the key and examine the surfaces within the mortise where the guide pin runs you will see dark marks made by the pin rubbing. They will almost certainly be at the top on one side and at the bottom on the other side of the mortise. Since it does not matter if the mortise is wider at the top and bottom surface of the key than it is at the centre, you can remove these marks gently with a fine file. A nail file or board will do very well, just a little at a time. If you make the whole mortise wider the key will of course be able to move sideways as well as up and down, something we try to limit as much as possible. You can rub a VERY soft pencil lead (one of those graphite pencils artists use) on the inside of the mortise, this reduces friction and noise; I don’t do this on brand-new instruments because then the tell-tale marks I’ve just told you to remove wouldn’t be there to see! While you have the keyboards out, you should examine every key in the same way since stiffness in key movement is much easier to detect without the weight of the jacks returning the key, and you will find a few more instances of barely detectable stiffness. Correct them all and blow or gently hoover out any bits of fluff etc. you may find on keyboards and inside the keywell; Then refit everything, and award yourself a nice drink to celebrate your successful completion of a first service. There are a lot of independent causes of this problem, and you must determine the specific cause before doing anything. Play the offending note, watching the plectrum. Stop the vibration of the string with the finger then let the key return while watching the jack and see that the tongue returns past the string. If it doesn’t, pressing the jack down with the finger may do it . If this is the case the jack may need to be shortened using the adjusting screw at the bottom. This usually means that the string band is now lower than it was, and you should expect a few adjacent notes to require the same attention possibly on all three rows and then you might need to manipulate the dampers as well since they may be pressing too hard against the string (play the note, release the key, then with the finger move the string gently and horizontally away from the damper; if the jack drops appreciably you need to trim or move the felt until the damping works but the jack returns to the key). (d) The spring is too weak or missing. (c) Move the tongue manually (I use the tip of the scalpel) and if there is anything preventing movement you should be able to correct it. (d) If the spring is too weak, it can be made effectively stronger by inserting the tip of the scalpel between spring and tongue, edge towards the tongue, just a few millimetres below the top end of the spring, and press the spring over the back of the blade to bend it, this often works. If the spring is missing or if you wreck one, pop down to your local shop and rummage through the expensive paintbrushes to find one with hairs of a similar diameter, and plenty long enough, to those on a complete and working jack. Now you have a moral dilemma, should you buy the whole brush or just snip a few hairs off!!!??? The hair is inserted into the hole in the back of the jack up towards the tongue, almost to the top of the jack. then the lower bit is bent again using the back of the scalpel blade and fed through the hole that goes down through the jack to appear at the front. From here it is pulled through until the spring is the right length; cut off the excess bit you pulled through.